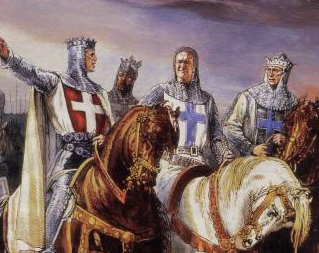 The Crusades were a series of religiously sanctioned military campaigns. Called by the pope and waged by kings and nobles who volunteered to take up the cross with the main goal of restoring Christian control of the Holy Land. The crusaders came from all over western Europe, and fought a series of disconnected campaigns between 1095 and 1291. Similar campaigns in Spain and Eastern Europe continued into the 15th century. The Crusades were fought mainly by Roman Catholics against Muslims and Greek Orthodox Christians in Byzantium, with smaller campaigns waged against pagan Slavs, pagan Balts, Mongols, and Christian heretics. Orthodox Christians also took part in fighting against Islamic forces in some Crusades. Crusaders took vows and were granted a plenary indulgence by the pope.